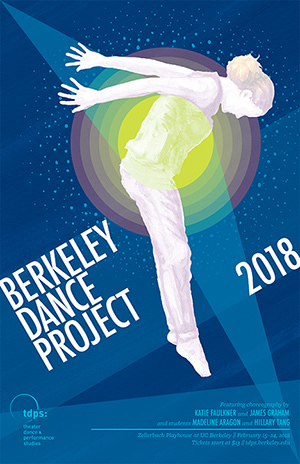 "Berkeley Dance Project 2018" features works by professional Bay Area choreographers Katie Faulkner and James Graham, as well as by TDPS student choreographers Madeline Aragon and Hillary Tang. Berkeley Dance Project opens Thursday, February 15, 2018 and continues through Saturday, February 24, 2018 at Zellerbach Playhouse. Performances are Thursdays, Fridays and Saturdays at 8pm. Katie Faulkner (the award-winning founder of little seismic dance company) has created a piece that uses movement and projection mapping to examine the physical changes that women undergo as they progress through puberty, childbearing, aging, and illness, with a specific focus on the power that women possess in their ability to reproduce. On the heels of a year of female action and activism (2017s Womens March on Washington, and the recent #MeToo and #TimesUp movements), Faulkners piece, performed by an all-female cast, gives voice to the physical experience of being a woman in the world. Original student choreography is also featured in "Berkeley Dance Project 2018." Works by TDPS students Madeline Aragon and Hillary Tang will be restaged on a larger scale, after premiering in December as part of TDPSs Fall Choreography Showcase. Aragons duet conveys the challenge of clear communication between two people, and the resulting impact on relationships between friends, lovers, or family members. Hillary Tang's solo exposes her personal process of acknowledging a toxic relationship, removing herself from the abuse, and ultimately finding internal peace and clarity.